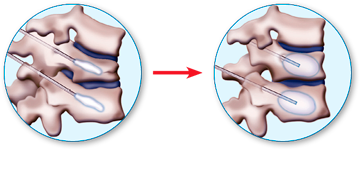 A vertebral compression fracture is a special form of a vertebral fracture. The bone of the vertebral body collapses by compression. The vertebral body, thus, shrinks down in height. Vertebral compression fractures are relatively common with certain risk factors. What are the causes of a vertebral compression fracture? Most vertebral compression fractures occur when the bone structure is not stable enough to withstand everyday stresses. Such is the case with generalized bone diseases like osteoporosis or metastatic malignant tumors within the vertebral bodies. Osteoporosis often occurs in women after menopause, but also other risk factors can lead to weakening of the bone: smoking, excessive alcohol consumption, radiation therapy of the spine, a long-term treatment with cortisone or end stage liver and renal disease. Once the bones are so “brittle”, often a very small “event” can cause for a collapsing of the vertebral body. What are the symptoms of a vertebral compression fracture? Acute vertebral body compression fractures can lead to very severe back pain with a sudden onset. The treatment options for vertebral compression fractures used to be very limited and in many cases not very effective: the administration of strong painkillers, wearing of a brace and bed rest. In some older patients, the provided pain medication may lead to states of confusion, the brace is judged uncomfortable by many and there are cases where the bed rest even further worsened bone structure. For several years now, new and effective minimally invasive procedures for the treatment of vertebral compression fractures have been available. The collapsed vertebral body is re-augmented and then stabilized with artificial bone substitute. This new method offers rapid pain relief and allows a fast return to normal daily activities.